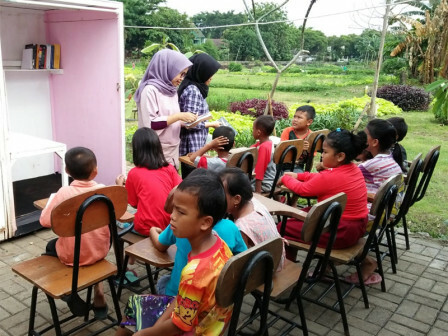 For the sake of visitors' convenience, a number of facilities and infrastructures in the Agro Educational Tourism, Cipinang Melayu Urban Village, Makasar, East Jakarta keep being added, especially for reading park.
" Taman bacaan ini baru kita siapkan hari ini, jadi masih butuh penataan"
"This reading park is still new, so it needs arrangement. We'll open soon," expressed Cipinang Melayu Urban Village Head, Syahrul Munir, Tuesday (1/15). I t was set up in one corner of the Saung (huts) that is in the Green Open Space (RTH). We have 50 books and 14 chairs for the visitors. There are also seven chairs in the field, precisely behind the Saung. His side is also about to request reading books through East Jakarta Library and Archive Sub-department that is still under process. As for the information, books that are already available such as story books, fairy tales, vegetable cultivation, fish, fruit until general knowledge. Rendy (12), one of visitors admitted that he and his colleagues can read books while traveling. "Its like at home. Hopefully the book can be added again," he stated.